This is part 2 of a 2-part reminiscence about Kaye’s childhood home. There was nothing extraordinary about the house I grew up in, yet everything about it was extra-ordinary by today’s standards. The house was built in about 1884 by Jasper & Meta Marie Johnson, my maternal great-grandparents. It was a white farmhouse with wood siding and fish scale shaped siding at the peaks. My great grandparents had a beautiful open front porch with gingerbread trim and when my grandparents lived there, they enclosed the porch. In today’s world it would now be called a three season porch. The two story house faced the south, set back from the road with two rows of about 6 elm trees in each row. As a child I thought the rows of elm trees gave my house a castle-like entrance even though the driveway was just beyond the rows of elms. There was only a dirt cellar where canned goods were kept, and you got there by outside steps on the East side of the house. When my life began in this house I was just two years old and there was no indoor plumbing, nor central heating. There was a pump just outside the back door under the wind mill where we drew our water and there was a big wood stove in the middle of the dining room. The kitchen got most of its heat from the old cook stove. The outhouse was just a short distance from the back door to the north and we had chamber pots in our bedrooms so we didn’t have to get up and go outside at night. On the main level there was the kitchen, dining room, living room and my parents’ bedroom. To the north there was an enclosed porch as we called it that had a row of windows on the north wall and that’s where you entered the house from the back door. In this porch, my mother did laundry and eventually the west end was used to make way for an indoor bathroom! This porch also had a desk where my Dad would sometimes do bookwork and a chrome dining set was placed in front of the row of windows. In the summer months we often ate in this room. When other farmers would come to help pick corn or combine oats, my mother fed them on the back porch. They could wash up in the laundry tub sink and wouldn’t have to take off their dusty overalls. Upstairs there were three rooms: my bedroom I shared with my sister and another bedroom where my two brothers slept. There was also a room that faced the north, thus we called it the “north room”. No one slept in this room and when I was growing up it was used to store things that weren’t used anymore like our 6 year old crib and boxes of who knows what! The hallway was quite large and at the top of the stairs there was an old dresser that sat there for years holding off season clothes and usually had stuff piled high on top of it. As a young child I don’t remember the house getting much remodeling or updating, but it was kept sanitary and picked up by my mother’s almost constant, deep cleaning. The bedrooms had the original wallpaper that was stained and peeling and the ceilings were plaster. Occasionally in my bedroom there would be a sticky substance dripping from one of the walls and it would stain the old wallpaper even more. The floors were wide pine boards although in my brother’s bedroom the floor had been covered with thin dark brown linoleum. My bedroom floor boards had been painted a light blue and were somewhat rough and splintering. There was no closet in my bedroom, just a shelf with a thin rod hanging from it where we could hang clothes from hangers. There were two windows facing the south and one window facing the west. This window was almost level with the floor, so in the heat of the summer I would put my pillow in the window sill and sleep on the floor to get any cool air that came through the window. It seemed my bedroom was either hot or freezing cold. In the winter ice would gather on the window panes even though my Dad put plastic inside covering the windows. I learned to be quick getting out of bed and getting dressed in the winter time. My sister & I had twin beds. Mine an old roll-a-way bed and hers a “Hollywood”. Her bed was always called that and I never asked why but supposed it was the brand name. There was one light on the west wall in my bedroom that turned on and off by pulling a string. My sister & I shared a dresser with two drawers each. Our farm house never felt big or scary to me; although there were times I wished that my bedroom was downstairs safely positioned next to my parents. Sometimes at night I would wake up to a whooshing sound and it felt like a bird was in our bedroom. I would turn on the light and see this bat flying around. I was scared and would always wake my sister, who would quickly pull the covers over her head and tell me to go back to sleep! I couldn’t do that, so would call for help and my Dad would come upstairs with a broom and a pail and he would get the bat into the pail and put it back outside. When my sister went away to college I had the room to myself. I liked it except when there would be a thunder storm. Storms always scared me and when I would hear the first crack of thunder I would run down the stairs and position myself right between my parents in their bed. I remember doing this until I was in junior high, then I found a safe place to sleep on the living room couch, near my parents’ bedroom. The most special times in the farm house were holidays like Christmas. We always cut our own tree from the “forty” as it was called. The “forty” was a 40 acre plot of land surrounded by roads just over the hill from our farm. The tree was always long needled and was often a bit bare in places, so my Dad usually had to drill some holes and stick branches in the bare spots. It didn’t matter to me because when we got the blue lights, silver balls, and ice-cycles on it, I thought it was the most beautiful Christmas tree ever! That was all the decorating we did for Christmas, but the kitchen was always warm with the heat of the oven as my mother baked about 12 different kinds of cookies not to mention pies, bread rolls, and her specialty: homemade baked beans. It was always a fun time when my cousins from Minneapolis came to visit. Eventually there were six children and the oldest two were the closest to my age. We did everything together. We usually had to help with doing dishes after a meal, so we made it fun; we played bank! We imagined that the silver ware was money and while we dried it and put it in the drawer, we counted it! As young girls we took baths together on Saturday night to be clean for church the next day. In my bedroom we pushed the two beds long sides together and slept on them the opposite way. This way all three of us fit together. When my cousins visited, this usually meant more of my relatives would show up either for the weekend or at least for Sunday dinner. This was a huge affair. Our dining room was a large room and we would open the Duncan Phyfe table and put in two leaves. Then the chrome table from the back porch was put on its end up to the Duncan Phyfe. If we needed more room, we’d add the small kitchen table. These tables weren’t the same height, but we would put table clothes on and we were set. Finding enough chairs sometimes was difficult, but we used the piano bench and always put it at one of the short ends where I sat with my cousin. Over the years the house changed some. Quite early after moving there, my parents had the basement dug out more and put in a furnace. I remember a huge sand pile in the back yard that was there a long time. This was a great place to play with toy machinery! The furnace was huge and burned wood and coal. My Dad cut our own wood, but I remember times he would order a load of coal. I’m sure this was easier on him, but it made the house dirty and when he started the fire in the early morning hours, I would bury myself under the covers as the coal smell was awful! I remember my mother complaining as it made her drapes dirty! When I was in high school, my Dad decided to re-do my bedroom. He took out everything down to the studs. We didn’t find any gold or other treasures, but we did find honey bees between the studs! It was quite a sight! This is what had been dripping down the walls and making the wallpaper sticky. I don’t remember how my Dad got the bees out, but when the room was done it was beautiful. My sister had done a 4-H project which involved re-decorating the bedroom. She had is all designed on paper and did sew new curtains, bedspread and skirt for around a dressing table. The dressing table was made from 2 peach crates put together by a board across the top. A new mirror was purchased for above the dressing table. My Dad build in a real closet and the floor was carpeted! I felt like I was the luckiest girl alive! Over the years, my parents carpeted other rooms and did other improvements. After my parents retired, it seemed the old house was too big and took too much work. After much discussion my parents decided to build a new house. They build it right in front of the old. Everything was on one floor and the furnace was both wood and electric so they were set! In 1982 there was a family reunion to celebrate 100 years since my great grandparents homesteaded the farm. The old house was still standing, but after that my Dad tore it down, saving the wood flooring and other re-usable things. In doing so my Dad discovered that several old beams had been charred by the old chimney. It was a good thing they had built a new house. My oldest brother lives in the house now. He has done some remodeling and used the old wood flooring in his dining room. He put on an open front porch, added a master suite, and a 3 season porch on the back to the north. There are no more elm trees, but the oak tree where we all used to swing still stands with a new swing installed in its branches. Bricks from the old house have been given to family members and I have a sampling of the old wall paper and some square nails that were used in the house. The house I grew up in was a good place. Nothing fancy, but it didn’t matter, there was love, good things to eat and plenty of people to play with. 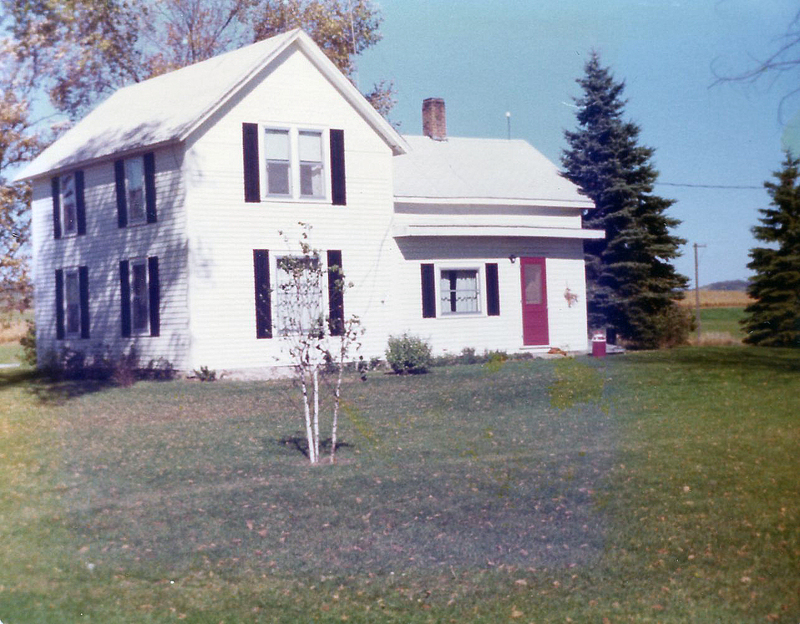 I have lived in many houses since my childhood days, but the house I remember most is the farm house of my childhood. Missed Part 1: The Barn? Read it here.